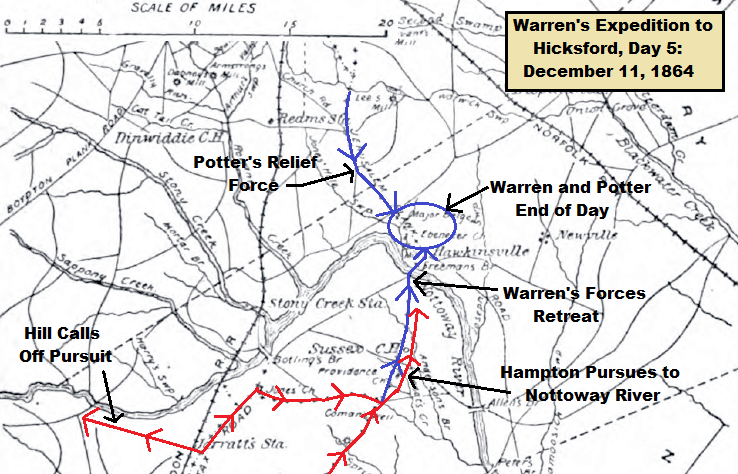 On December 11, 1864, 150 years ago today, Warren’s Stony Creek Raid on Hicksford was coming to an end. Warren simply had to reach the Nottoway River, bridge it with a pontoon bridge, and cross before Wade Hampton’s cavalry and A. P. Hill’s infantry interfered. As you’ve probably already guessed, December 11, 1864 proved to be an anticlimactic end to a successful raid for Warren and Gregg. But not before a little more controversy occurred. More murdered Union stragglers were found in Sussex Court House. The enraged Federals questioned several suspicious characters in the area, and when they didn’t provide a good response, they were hanged as guerrillas in the town square. Sussex Court House suffered badly at the hands of the Union troops, with even a church near the center of town being put to the torch despite the protest of some Yankee soldiers. The war at this point was a brutal one, and sometimes innocents were caught in the crossfire. The citizens unfortunate enough to live along Warren’s retreat route on December 10-11, 1864 learned that lesson personally. Warren reached the Nottoway at noon, as Lyman described, and quickly had two pontoon bridges laid at Freeman’s Ford. A. P. Hill gave up the pursuit early in the day with his infantry and headed back to the Confederate entrenchments southwest of Petersburg. Wade Hampton had more bulldog in him. He pursued the Federals all day, even sending one regiment all the way to the Nottoway, but the Federals had too much of a head start and Hampton couldn’t do much without Confederate infantry backing him up. Warren crossed his men, pulled up the pontoon bridges, and spent the night just north of the Nottoway with Potter.